The prescription bottle of chemotherapy tablets stood beside me through breakfast. 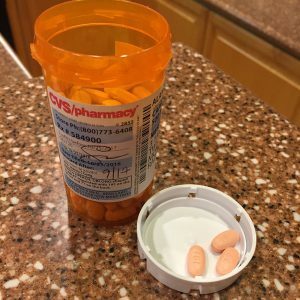 I had already removed the first three 500mg tablets and placed them in the overturned prescription bottle cap. Doctor X. and the pharmacist both stressed the need to take them after food was in my stomach. So I finished breakfast and waited a little bit. After 12 minutes, I tentatively reached for them. But, something caused me to pull back. Almost as if there was a force field blocking me from them. I looked to Becky for support. But, I knew what I really wanted was the acknowledgement that my, or more accurately, our treatment was about to begin. We're doing this together. We knew, without saying it, that we had to mark this moment. We needed to engage a ritual that celebrated the beginning of this treatment process. Maybe that's why I hadn't swallowed the tablets yet. Through breaking tears, aware of our shared uncertainty, but offset with lots of underlying hope, we looked at each other as I raised the three light orange tablets in my right hand. "Trust the healing power," Becky affirmed. I took in her words and struggled for my own. A simple "yes" emerged in my thoughts and released from my lips. It's the only thing that came to mind. And behind this yes was a belief that this substance I was about to swallow would do its work in my body. Eyes still locked, Becky and I fist bumped. Yes! We actually fist bumped. We are not fist bumpers by nature. I'm not quite sure if we've ever fist bumped before. But sitting at our kitchen bar, in our impromptu ritual, that's what happened between us. I lifted up my cup, half full of cold Earl Grey tea, threw the three pills in my mouth and washed them down. Treatment was officially started. 11am Wednesday morning was the start time for my initial radiation appointment. I checked in using my barcode wristband on the scanner at the side of the front desk. When the scan gets recognized, my name loads on the screen and then disappears. That lets them know I am here and loads my treatment data into the system. I enter the changing suite and choose my private change room. It's more like a spa than a hospital. In the change room is a single cupboard with two doors. The top door is shelves with gowns and robes. Bottom door is already worn gowns and robes - the dirty pile. I made a mental note not to mix them up. It takes me a bit to remember the order of dressing. The gown opens to the back and goes on first. The robe opens to the front and goes on over the gown. I strip down and don the radiation wardrobe. I lock my clothes and and other items in the locker outside the change room and proceed to the waiting room. Filtered water, magazines and a large screen TV are the included amenities along with the 20 or so chairs. Instinctively, I go to the water dispenser and pour water into a small Dixie cup. I scan the room while I do. There are others waiting there, most wearing my same outfit. But we don't make eye contact. I look just past them. I find my chair and sit strategically. My back is to the wall opposite the TV and entrance from the change rooms. I am also seated between the only other doors. One to the radiation area and one to the examination rooms. As I look around to the others seated here, I know we're all here for radiation which means we're all at some stage of the cancer treatment journey. But in this brief waiting time before we get called through either door, we sit in silence. I want to talk and ask, but I stop. I'm the youngest gown and robe wearing person in the room. The others all seem to be veterans. I know I'm the rookie today. Some people don't even wear the external robe. I catch myself wondering how they walk so confidently into the room with the open back exposed. I'm a little afraid to look and see if anything actually is exposed. I expect they are in a different type of treatment and refrain from pondering any more. I wonder what these others are thinking. Are they afraid? Are they freaked out? Are they alone in this journey or do they have the incredible type of support I'm blessed to have? I know I'm apprehensive and a lot nervous. Yes, I was shown everything last week, but this is different. This is the real thing. It's not just the set up. It's actually happening today. A few people come and some go. I wait about 10 minutes before the door opens and I am called by Bethany. She wears a long white lab coat and funky glasses. As I walk through the door she shakes my hand and leads me directly into the radiation room. A man joins us who introduces himself as Gerry. As I get to the door, another lady is walking behind me. "Hi, I'm Kristi and I'm taking up the rear!" she says with a grin. "Oops, that's awkward." I laugh, relieved at my broken tension. 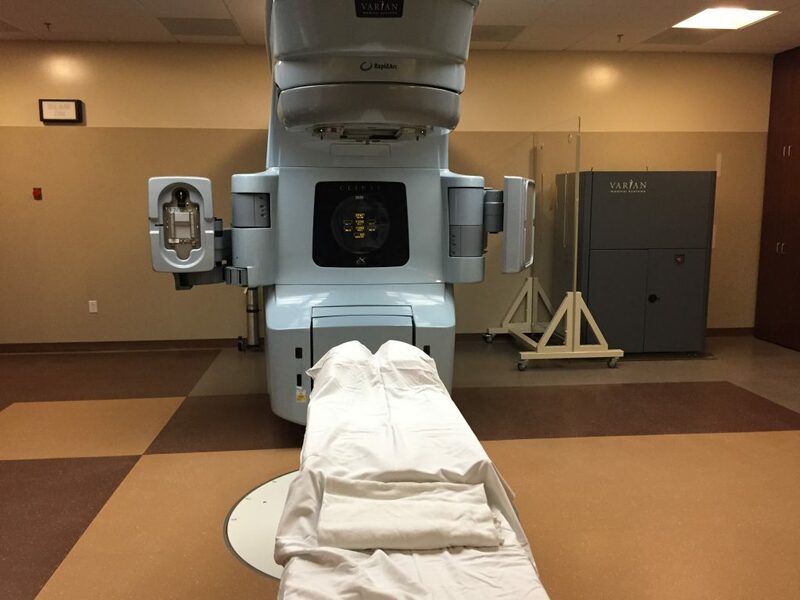 The massive radiation machine is dwarfed by the size of the room I enter. Under and in front of the machine sits a platform with some sheets on it covering the body mold. Bethany re-scans my barcode, asks my full name and birthdate and then asks me to explain the condition I have that needs this treatment. After she confirms my identity, Gerry asks me to remove my robe and lie on the platform. He helps me get situated in the mold, and then begins to move and adjust the settings. My "Yes" tattoos help them align me to the green lasers lines coming from the walls and celing. Once they have me in my final position, they ask me to lie very still. Bethany explains that they are going to take a number of X-rays and match them to the CT Scans done in my mapping session. This session will take a lot longer today than through the rest of treatment. She informs me that Doctor L. will take a look at the settings, the alignment and confirm everything is good to go. She checks to ensure I am okay and then leaves the room. I slow down my breath, lie as still as I can and feel the room around me. I can't see anything as my head is wedged into the hard body mold. The machine makes a lot of different noises. I wonder if I am moving or if it's just the machine moving around me. Then I hear beeps and clicks and more sounds coming from both the machine and devices around the room. My senses are fully alert. Either Bethany or Kristi enters the room again. I'm not sure who, as I can't see who it is. She tells me she is going to mark my skin with the pattern of the radiation beam. She draws on both hips and my lower back. Then she takes pictures of each drawing on my skin. I ask if she is a papparazzi. She gives an awkward laugh and says "No, your pictures won't be on eBay." "I bet she hears that a lot. Why did I say that?" I question my dorky statement. At the same time I wonder why I never knew that you could buy celebrity paparrazi photos on eBay. She finishes her photos and tells me the treatment is about to begin and it'll be done soon. She informs me the sounds will just go a little longer than I heard earlier. "Lie still" she reminds me and exits the room again. I lie still and hear the machine make all sorts of new sounds and it seems to move around me. Then, it's silent and still for a moment and I wonder if I am being radiated yet. But then, head munched into the sheets covering the hard mold, I hear a sound that reminds me of an old welding machine power supply and I sense more light in the room. I know this is it. I silently whisper, "yes" and try to remember what Becky said in our ritual after breakfast this morning. I cannot remember it. I try to feel what is happening, but I feel nothing other than the discomfort of my head pressing against the hard mold, and the sense of some intense light in the room around me. After 30-45 seconds, the sound stops and it feels like things on the machine are moving again. Then the sound comes back a second time. Then more movement and noises, and then a third time. And then after a few moments of silence I hear someone say, "You're all done!" I start to lift myself off the mold and platform, but she tells me to lie still. "You're way off the ground. Wait until we lower it back to the floor before I help you get off." I peek and see that I am 4-5 feet in the air. It's not long before she says it's okay to get up. I lift myself up, and Bethany helps me to move off the platfom. My first radiation treatment is complete. As the afternoon wears on, I hover near nausea. Not quite there, but close. My body feels different and weird. I keep drinking water as directed. I can only imagine that my body is trying to figure out what the heck just hit it today. My second dose of chemotherapy is consumed after dinner, during the World Series Final. As the Indians tie up the game in the bottom of the 8th, I'm not sure if the weird feeling in the pit of my stomach is related to the emotion of the game or the effects of the chemo. It's probably a little of both. Day 1 of treatment is done. Just 27 more to go. I'll keep you posted. Thanks for your amazing support. Praying for you already this morning prior to reading. And I will continue with my prayers for healing, comfort, for peace and extra strength. For you and for Becky. We are praying for you that the Lord would bless you spiritually and physically. Tom, fist bumping you from the East Coast. Peace and positivity to you an Becky!